Figs (Ficus carica) make a great choice for home gardeners eager to try growing their own fruit sustainably. Requiring neither meticulous pruning and thinning nor regular spraying, figs are the ideal fruiting plant with which new gardeners can build their confidence. Figs, native to the lean soils of the Mediterranean, need abundant sunshine and good drainage to perform at their best. 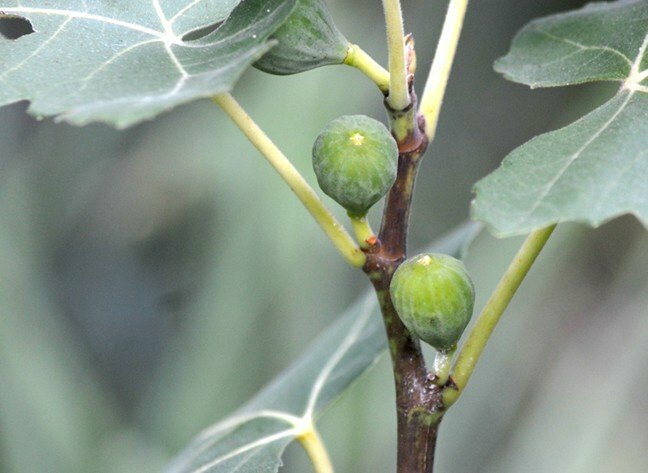 In the clay soils of the Triangle, figs can generally obtain the nutrients they need without additional fertilizers—another trait in their favor if you aspire to garden sustainably. Feeding annually with compost will support good drainage and the plant’s ability to extract required nutrition from the soil. Only fertilize if indicated by a soil test. Growing figs in highly fertile soil may result in lots of vegetative growth but little fruit. As with all fruits and vegetables, figs need regular water as they set fruit. Long periods of hot, dry weather can stunt the fruits’ growth or produce smaller yields. But don’t get heavy-handed: Excessive moisture, fertilization, or shade may cause fruit to drop prematurely. Unlike many fruits, pests or diseases don’t bother figs except for root-knot nematodes. Root-knot nematodes are microscopic roundworms that cause damage to roots of plants. If you’ve had problems with these pests before, avoid planting figs in that location or grow them in large containers, where they’ll perform very well. 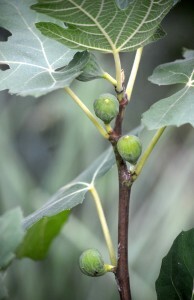 Figs can produce two crops of fruit per year: a small one in early to mid-summer on the previous year’s wood, and a larger crop in autumn on the current year’s growth. You’ll know the fruit is ready to harvest when it changes color from green to brown or violet and hangs down instead of points up. You may see a small bead of nectar on the fruit when it ripens. Fig trees can grow to be quite large—up to 15 feet or more—but are easily controlled by pruning. If you don’t care how large they grow, prune only to remove dead, injured, or diseased wood or to improve air circulation. Fall is the best time to plant figs in our area. Purchase 3-year-old plants, because plants younger than this tend not to fruit well, and make sure the selection is one recommended for the Southeast. Some fig varieties, particularly those grown in the West, require wasp pollination. Varieties that perform well in the Southeast don’t require cross-pollination, so purchase your plants from a reputable local nursery. ‘Celeste’ and ‘Brown Turkey,’ both readily available, are recommended for fresh eating and for preserves, and grow well here. ‘Alma’ is prized for eating and preserves. ‘Magnolia’ is highly recommended for preserves. Note that ‘California Brown Turkey’, sold in mail-order catalogues, is not the same as the ‘Brown Turkey’ that grows well in the Southeast. When planting, dig a hole twice as wide as the root ball and to the same depth, or up to 2 inches deeper, as the container in which the plant is grown. Remove as much of the potting mixture as you can, and trim away any dead roots. Place the plant in the hole, spreading the roots out carefully. Mix the excavated soil with compost and backfill around the plant, top-dressing with additional compost if desired. Water well. A 2 to 3 inch layer of compost, shredded bark, or chopped leaves will keep figs’ shallow root systems cool and moist and cut down on weeds. Don’t pile on the mulch any deeper, as it can smother the plant. Figs will not store fresh for more than a few days, so unless you plan to make jams and preserves, enjoy them promptly. Sprinkle the crumbled goat cheese on the bread and put it in the oven to toast. Wash and slice the apple and figs. When the bread is golden and the cheese is soft, remove the cheese toast from the oven, and top with figs and apple slices. Drizzle with honey and a pinch of freshly ground black pepper, and enjoy.